So let’s all get out there and enjoy the spring, maybe hitting up an independent bookstore while you’re out. But you might want to wear a hoodie; there’s no reason to go all crazy. 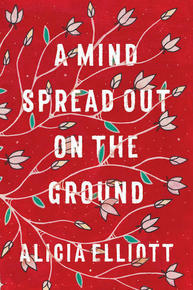 Alicia Elliott's book of essays, A Mind Spread Out on the Ground, is beyond impressive. It's an incredibly important book—right now and always. Her essays about Indigenous life, about her childhood, about love, about activism, about racial inequality and about just personal stuff, are full of honesty and pain and some laughter. This is an easy read because of Alicia's likeable personality, but it's a difficult (and necessary) read because of the topics. I'm passing this around as much as I possibly can. A fantastical novel that immerses readers in Inuit mythology and culture, Those Who Run In The Sky is a vital contribution to the Indigenous literary canon. 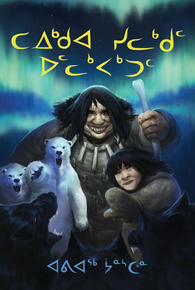 Centred around the theme of self-discovery and deeply rooted in Inuit traditions, the story moves at a brisk pace to a satisfying ending. Highly recommended for ages 12 and up. 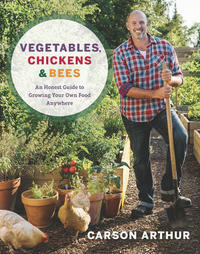 If you are looking for a bit of inspiration for your backyard, Carson Arthur’s new book, Vegetables, Chickens & Bees, is a must. Arthur goes beyond just which seeds to plant and includes lessons on how to measure your sunlight, test your soil and properly plan where to plant those seeds so they are happiest. Then, when you want to take things to the next level, he teaches you the basics of keeping chicken and bees. With Arthur’s help you will be on the road to growing your own food in no time. 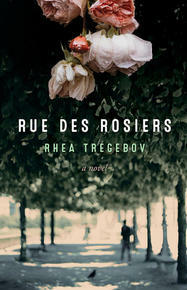 Sarah, the main character in Rhea’s new novel, is unable to move forward in love or work, or relationships with her sisters, until a chance trip to Paris breaks her impasse in unexpected ways. Her discovery of a sign at a local Metro station which reads “death to the Jews” brings back childhood fears and dreams which have contributed to her emotional difficulties and foreshadows an event that echoes the terrorist attack in 1980 in Paris. The novel is beautifully written and is one that I definitely will want to read again as the themes are so important for the times we are all living through. Caveat: Paul was the editor for my last book. But it’s rarer to love writing from someone you know than you’d believe. In fact, a lot of writers avoid reading their friends’ writing—easier to nod and say, “I just haven’t had time to read it,” than to learn you don’t like it. After all, if you don’t like the writing will you still like your friend? All of this to say, I love Paul Vermeersch’s writing and I would even if I despised him, which I don’t. 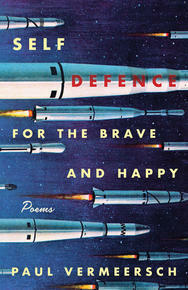 His new poetry collection, Self-Defence For the Brave and Happy, is especially beautiful. Paul’s wisdom shines through here. An artist himself, the cover and illustrations of his book are chosen carefully, reflecting the “Atomic” modern age of the 40s/50s and adding to the post-apocalyptic vibes. Paul deals with a future that reflects the past—he asks, what if? as much as tells us, here’s what happened and here’s what is going to happen. My favourite poem, “On Being Wrong” states: “Everyday, there are new ways of being wrong…. We are waking up to it. We are opening our wrong eyes.” He may be correct, but I guarantee that if you read this poetry book the wrongness of the world will seem a little more right. 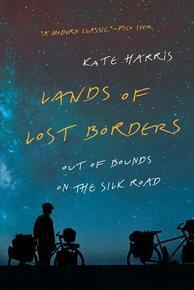 Never before has an author transported me as much as Kate Harris in her part travelogue, part meditative memoir, Lands of Lost Borders. In 2006, dissatisfied with her life in the lab and as a waypoint in her misplaced longing to journey to Mars, Kate Harris and her childhood friend Mel set off to cycle the length of the Silk Road. In between tales of adventure in the wild emptiness of the Tibetan Plateau, she ponders the nature of borders, exploration, and the history thereof. Harris's narrative, both poetic and pensive, is so beautifully constructed that it strikes the reader with a sense of nostalgia and belonging; I left each page feeling like I had been cycling alongside her. Despite already having read it twice in the past year, I still find myself gripped by her every word. Even if you do not cycle, have not picked up travel lit before, or have yet to illegally hop the border into Tibet, you will find a home in this contemplative book.